-2009 13.2Hh reg and branded American Sportpony by Rosedale Top Cat. Flashy dark bay with lots of Chrome. Looks and moves like a small Warmblood. Has shown for years from short stirrups to medium pony. Excellent to ride and frames easily. Not spooky, terrific children's pony. 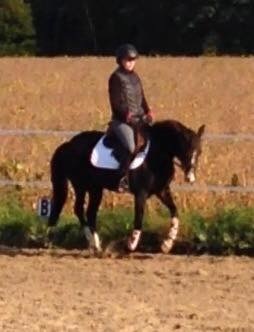 Qualified in SportPony Dressage for the Royal Winter Fair.